A few years ago, I was sitting in church and a video was shown that contrasted the influence of both the church and the home on a child’s life. The point of the video was to show that while Sunday mornings definitely have an impact on how a child experiences God, the majority of how a child perceives, internalizes and encounters God happens in the home. So, while it is important to bring your child to church (and this might be obvious to some)- you can’t simply leave your child’s faith in the hands of his/her Sunday school teachers and expect that they will have a meaningful relationship with Him. Click HERE to watch this 2 min video. If you’re like me, you care deeply about your role in influencing your child’s mind and heart, but can sometimes feel overwhelmed at how to do that or even where to begin. 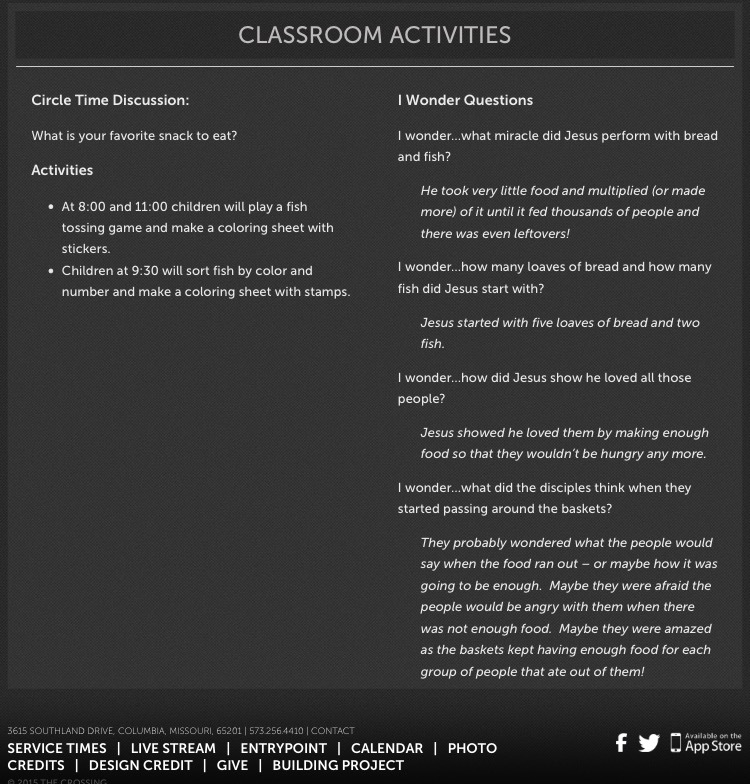 My children are small and there are tons of resources out there- everything from the Jesus Storybook Bible, to flannelgraphs (which I’ve seen make the Bible come alive for my kids), online curriculum with crafts, coloring worksheets and memory verses… but I want to share two simple ways I’ve tried to “connect the dots” for my children between church and home. The first has to do with what they’re learning. The second has to do with the songs they’re singing. 1. Find Out What They’re Learning and Ask them About it. 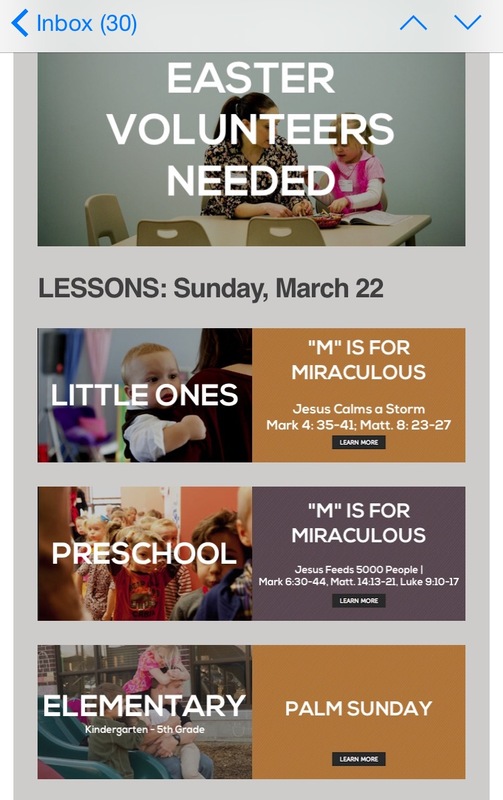 Our church has made this really simple through weekly handouts and email updates. 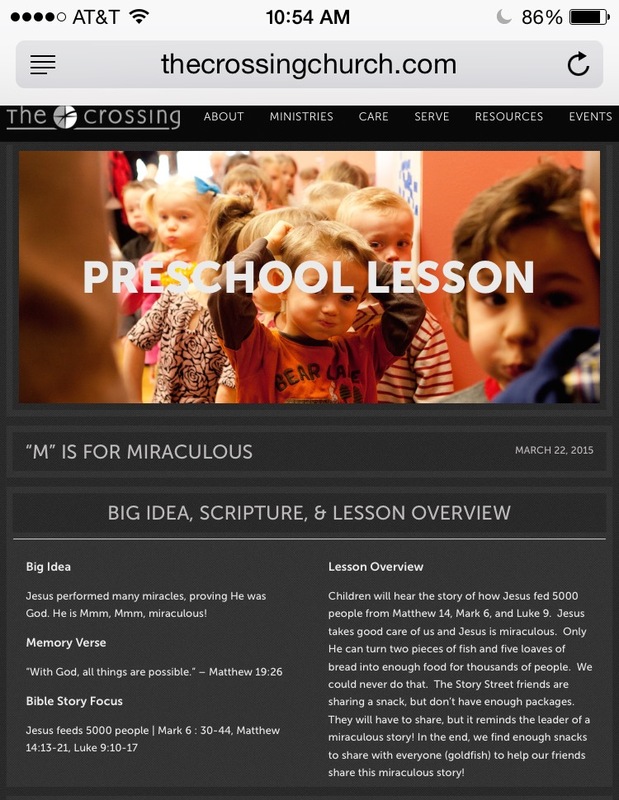 As we’re driving out of the church parking lot, I pull up the email on my phone, click on either “little ones” or “preschool” and read the Big Idea and Overview from what they’ve just learned that morning. Then I ask them each a simple question like, “What did you learn today? or What did you talk about at church?” to see what they remember on their own. I ask them about the lesson and the craft they did. Our church actually writes out questions for you (see I wonder questions below)- so I try to go through those and prompt them if they need help. Then I prompt them with their memory verse & help them repeat it. It’s almost too easy. But really what they’re providing is a reminder that I need to be engaging with my child over what they’ve been taught… and affirming those things. Don’t feel like you need to have a big knowledge of the Bible to engage with your him/her. It’s just important that your child begin to see that Mom and Dad care about God too. And that they avoid the sacred/secular split that happens when church and home are worlds apart and God is a Sunday thing. Parent email with info for each age group. It also reminds me of a book I read called “Everyday Talk: Talking Freely and Naturally about God with Your Children” in which the author talked about how it’s important to weave in spiritual conversations amongst your simple everyday talk- be it about the weather, birthday presents, friends or anything else. Knowing what my kids are learning about in church helps put it on my radar so that when we’re cooking or going for a walk, taking a bath or watching a TV show, I can try to bring God into the conversation. 2. Play Their Church Music at Home. Not sure how many of you are familiar with Spotify, but as an alternative to iTunes, you can subscribe for a yearly amount and listen to music without having to pay for each album. I like it because that I can create playlists on my iphone and play them at home and in the car. When we’re driving, we plug in the auxiliary cord and play music that way. At home, we have dance parties in our living room by playing music from our phones through our AppleTV (a $69 product that sincs with your computer & makes your TV a smart tv). 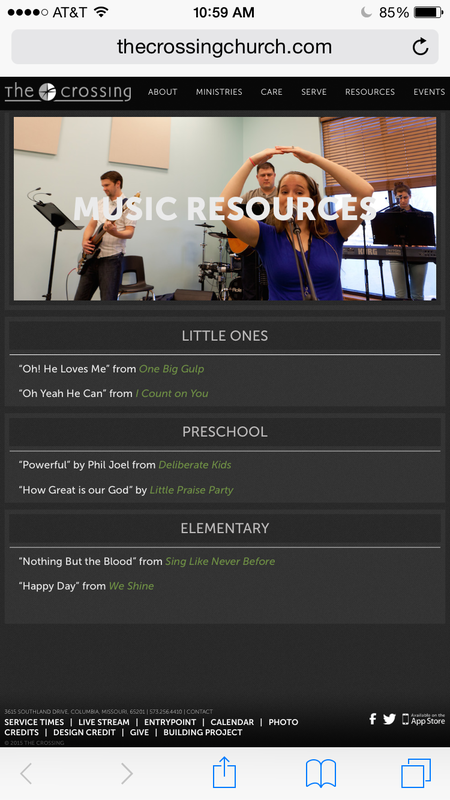 I LOVE that our church makes it easy by telling us what songs the kids listen to each week. So, amongst other playlists, we have a church playlist where we keep adding music they hear on Sunday mornings. While I haven’t been able to find all of those songs on Spotify, I’ve found about 95% of them. It’s fun to see our kids dance around and know the words to these songs I’ve never heard before… And to see the look on Pearl’s face when she hears the song “Two by Two” and lights up & says, “I know this song! We sing this in my class!” While it’s good for them to hear Mom & Dad’s worship songs, there’s also a huge benefit in them hearing their own worship songs. Talk about connecting the dots. As a side note, you can share your playlists with other people- here’s my Crossing Kids Music Playlist, if you want it! This lets me know what songs theyre hearing on a Sunday morning. I simply copy and paste these song titles into the search engine on Spotify or iTunes. This is what Spotify looks like on our computer, though I typically use it through my phone. And here’s our Crossing Kids Music Playlist on Spotify, which we’re continuously adding to. Click HERE or on this picture if you’d like to listen to it. Ginger & Pearl dancing to our Crossing Kids Playlist. Yes, there are times when they just want to listen to “Let it Go” on repeat- and we do that too- but there are also times to turn Frozen off and turn their Sunday songs on- to bring those songs from the church into our car and home. 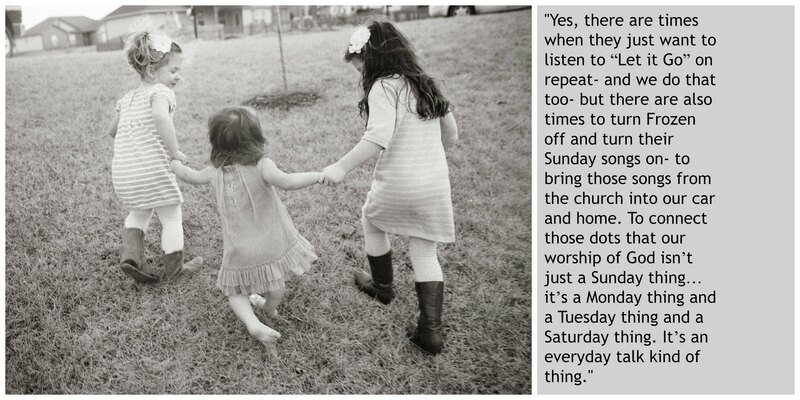 To connect those dots that our worship of God isn’t just a Sunday thing… it’s a Monday thing and a Tuesday thing and a Saturday thing. It’s an everyday talk kind of thing. How do you bring church home? What are some specific ways you help your child connect the dots between church and home? I agree that the spiritual growth of our children is the parents responsibility. We can’t outsource that to the church. Wishing we had done a better job with this….but so grateful our grandchildren are benefiting!